On April 27, Jeffrey Hunter, 22, knew that a tornado was rapidly moving towards his house in Vilonia, Arkansas. With only minutes to spare before the massive EF-4 twister was to hit, he sent a series of texts to his mother, 20 miles away, that ended up being his final goodbye. Now, those texts are being cherished by Regina Wood, Hunter’s mother, who said she’ll hold on to them forever. ‘First he said “Mama, I’m so scared,”‘ Wood told nwahomepage.com. Despite the impending diaster about to hit Hunter, Wood tried to calm her son, who was holed up in the bathroom, telling him he would be okay. ‘He knew how bad it was, they say it’s going to be a direct hit,’ Wood said . ‘I have a text on my phone as the tornado was hitting “Goodbye mama,”‘ says Wood. ‘All you could hear was horns going off and people hollering help help,’ said Lynn Watkins, who lives a few doors down from Hunter, who was a senior at the University of Central Arkansas. ‘I made my way, he was at that house right there,’ said Watkins. Lying there unconscious on the ground was Hunter. She hadn’t heard anything from him since his last message. 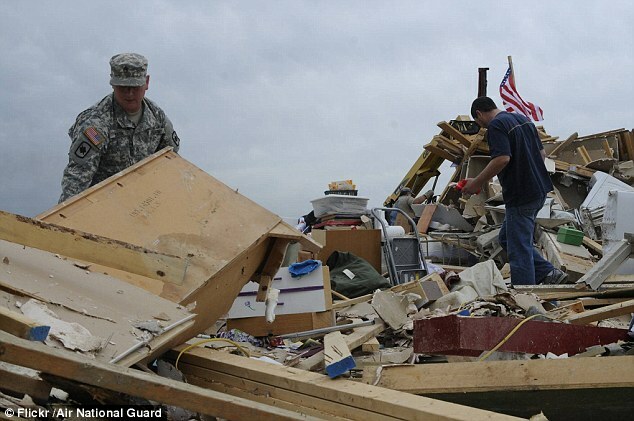 Several other victims died during the twister in the Vilonia neighborhood. Hunter was was his father and stepmother when the tornado hit, but they escaped death with serious injuries. This Guy Jumps Off This Building. Insane!